A Dongria Kondh protest rally against "intimidation"
The National Confederation of Human Rights Organisations (NCHRO), an apex body of right-based advocacy groups, has taken strong exception to unprecedented “intimidation” of Odisha’s tribals and activists pitted against multinational corporation (MNC) Vedanta Resources’ Rs 5000 crore aluminum refinery venture. An NCHRO team, investigating into “false cases, arrested, torture and killing” in the name of anti-Maoist operations, said the whole effort to seek reversal of the 112 gram sabhas’ decision declaring the entire Niyamgiri hills area – where Dongria Kondhs, a primitive tribal community, lives – as a mining free zone. The intimidation is taking place with the help of “various paramilitary forces as Central Reserve Police force (CRPF), Special Operation Group (SOG)… stationed there in the name of curtailing the Maoist activities”, an NCHRO team, consisting of its senior office bearers Prof Amarx Marx, Reny Ayline, Narendra Mohanty, Advocate MA Momen Halder, and Jharkhand student leader Abdul Hannan Jharkhand, said. In yet another village, Dangamati, the team met the tribals who gave details of Manda Katraka (20), who was “killed in a fake encounter by the SOG on February 27”, and later declared him a Maoist. 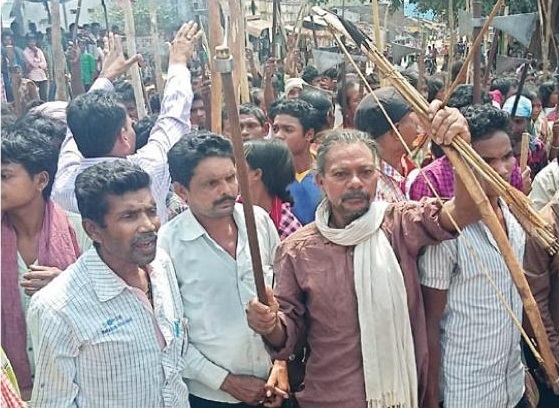 In a third incident, Dasru Kadraka, the 25-year-old Adivasi youth leader and activist of Niyamgiri Suraksha Samiti (NSS) was arrested on April 7 from Muniguda market. “The local police are falsely presenting him as a Maoist militia leader but they have not recovered any arms-ammunition or incriminating evidence to prove it”, the report said. Pointing out that this has been continuing for quite some time, the NCHRO said, on November 15, three Adivasis of Nisanguda village were killed by anti-Maoist combat force SOG. Then, in the third week of November 2015, Drika Kadraka, an Adivasi activist, was picked up by the anti-Maoist squad stationed in that area. “Though he escaped from the clutches of police and returned he committed suicide as a result of mental torture within the next few days”, the report states.